Chinnor came into the game on the back of two wins from their first two games in National 1. Today they faced a fresh test against Richie Williams’ side who were sure to try and play some running & creative rugby. From the kick off Chinnor applied their first waves of attack on the ‘Blood and Sand’ line only to spill the ball and give the host the immediate chance to counter. This led to some over eagerness in the Chinnor defence. The subsequent penalty allowed Cambs to take an early 3 point lead. Undaunted Chinnor stuck true to their game plan & structure and gained a penalty out wide. Opting for the corner and following a series of maul infringes from the hosts referee Stephen Coleman (on exchange from Hong Kong) brandished the only yellow card of the afternoon. Crucially Chinnor failed to take immediate advantage of the ensuing line out and had to wait until 14 mins for Reon Joseph who was found out wide. He cruised through the gears and the Cambridge cover for Chinnor’s first try which Bertie Hopkin converted. Cambridge responded in emphatic fashion providing an attacking threat that Chinnor had yet to encounter this season. With slick handling and varied patterns the vistors were on the back foot and winger Kwaku Asiedu sped through for his first try of the game. With the conversion missed the score stood at 8-7 with 20 mins gone. This boosted Cambs confidence and Chinnor struggled to contain their powerful midfield. This ultimately led to an uncharacteristic mistake on the Chinnor line which gifted Ziana Alexis with a try. With the Villagers losing their defensive shape Kwaku Asiedu ran in his second try giving Cambridge an ominous 20-7 lead. Facing their biggest task of the season so far Chinnor reacted with some impressive play stretching the hosts defence with phase after phase of powerful and intelligent play. This was rewarded by player/coach Dan George dotting down following a catch and drive lineout. Then on the stroke of half time some neat work by the back line found Reon Joseph in space to make it 20-17. The second half saw Chinnor on a mission and they flew out of the blocks and after sustained pressure a Rob Bell try edged the visitors ahead 20-22. There followed a lengthy period of Chinnor attack v Cambs defence. 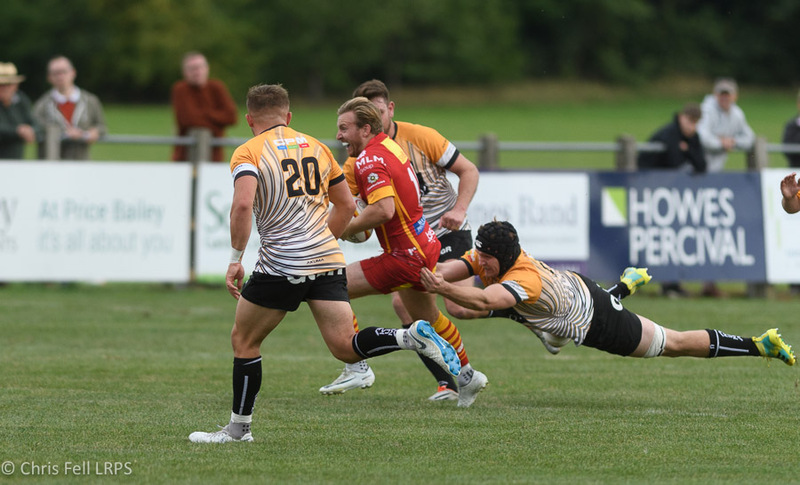 The home side’s line speed and organisation proved a tough nut for Chinnor to crack and on several occasions the ‘Black and Whites’ came away empty handed from promising positions. Whether this was due to a lack of creativity in attack or high work rate in defence is a matter for the sidelines to debate. The game, as a spectacle, was great entertainment and Chinnor sealed their third win of the season at a tough location with a bonus point. It wasn’t Chinnor’s best performance of the season but the team showed great character to react and turn the game around. It’s early days in the season and as the team get accustomed to life Nat 1 and regain some of the attacking flair shown in preseason some really great entertaining rugby could be store for the Kingsey Road faithful. But at the moment 14 points from a possible 15 is a great start in anyone’s books and a solid basis on which to build. Cambridge: Rayner; Asiedu, Yawayawa, J Ayrton, M Ayrton; Penfold, Duffin; Peck, Griffiths, Alexis, Conquest, Baxter, Bennoy, McCloud, Hipwell. Replacements: Rayment (McCloud, 11-19; Griffths, 60), Green (Penfold, 34-40), Meek (Alexis, 52), Britton (Conquest, 57), Creighton (Duffin, 64), Green (Asiedu, 68), Alexis (Peck, 75). Chinnor: Goss; Joseph, A Dancer, Barnes, Holland; Hopkin, Brazier; Bingham, George, Gilding, Thomas, Ramshaw, J Dancer, Bell, Burns. Replacements: Betts (Bingham, 44), Manning (Bell, 57), Barton (Brazier, 61), Ranaboldo (Thomas, 68), Bingham (Gilding, 70). Sin bin: Cambridge – Griffiths (technical offence, 9). Scorers: 3min Penfold pen (3-0), 14 Joseph try – Hopkin con (3-7), 20 Asiedu try (8-7), 27 Alexis try – Penfold con (15-7), Asiedu try (20-7), 36 George try (20-12), 40+1 Joseph try (20-17), 45 Bell try (20-22).